Premium Dual Screen TV Ceiling Mount Bracket - 45kg (Black) + FREE SHIPPING! 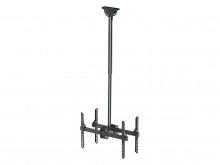 Professionally mount two LCD, Plasma or LED TV's with this adjustable ceiling bracket! Been looking all over for that perfect dual screen TV ceiling mount - well look no further! Quite possibly constructed from the same steel used to build army tanks, this quality ceiling mount offers the unique proposition of mounting two flat-screen TV's, with vertical tilt movement. Take it from me; every aspect of this bracket is a winner. What do you do if you have no timber wall studs? Try this ceiling mount. What do you do if you need a 10 degrees of vertical tilt towards the floor? Try this ceiling mount! 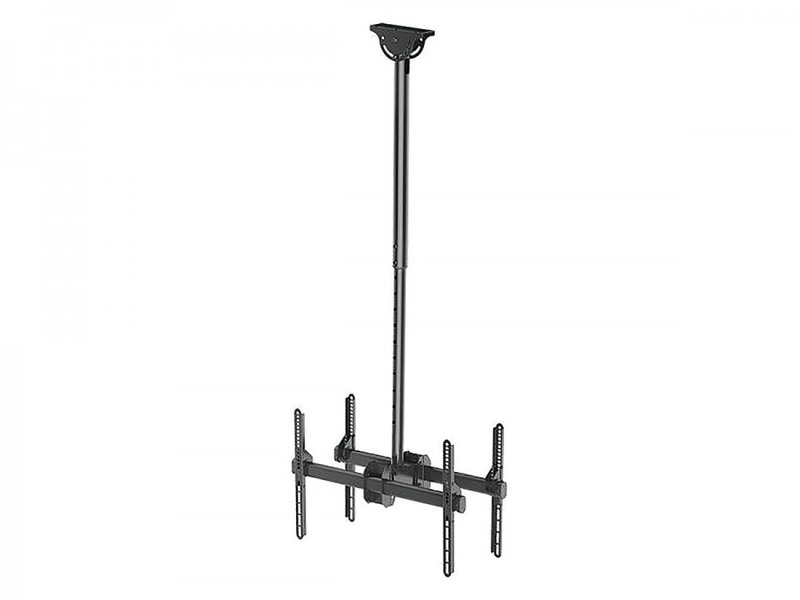 Plus, you can vertically extend the mounting pole from a distance of 1060mm to 1560mm (ceiling to centre of screen). Top it off with a 5 Year Cable Chick Warranty, easy DIY installation and a finished look that will impress no matter where you put it, and you’ve found yourself the ultimate in home theatre and commercial application television mounts! Read on for even more great specs! This bracket is compatible with concrete ceilings AND timber beams, but the mounting plate is too large for a single beam/stud, and may require either a double beam or an additional block/brace. The instructions also encourage bolting direct to the concrete/timber and not to drywall or plasterboard. As with all wall and ceiling mounts, you’ll need a solid anchor point, so if you’ve got access to your ceiling crawlspace you should be able to install a brace wherever you need it. Don’t forget you finish off this professional installation with some AV Wall Plates to keep your cabling as tidy as possible. Please note: As with all wall and ceiling brackets, a timber beam is essential for proper, safe mounting. Due to the size of this item, Express Delivery may not be available. Step one is to measure your screen. This bracket is 480mm wide and the arm is 435mm high, so if you television is larger, the bracket will be hidden by it when mounted. Step two is to measure the mounting holes on the back of the television (from centre to centre). This bracket adjusts to fit a maximum of 810mm wide and 480mm of height between mounting holes. Step three is to look up the weight of your televisions (check in the manual or online). If each screen weights less than 25kg, this bracket will work fine! Works with Plasma, LCD and LED screens from approx 32" to 55"
I recently placed an order through Cable Chick and received my parcel very quick! Great service and communication! Should be more of you in our nation! Thanks again.